Of the many ways that humans make sense of our world – with our eyes, ears, nose and mouth – none is perhaps less appreciated than our tactile and versatile hands. Thanks to our sensitive fingertips, we can feel the heat before we touch the flame, or sense the softness of a newborn's cheek. But people with prosthetic limbs live in a world without touch. Restoring some semblance of this sensation has been a driving force behind Stanford chemical engineer Zhenan Bao's decades-long quest to create stretchable, electronically-sensitive synthetic materials. Such a breakthrough could one day serve as skin-like coverings for prosthetics. But in the near term, this same technology could become the foundation for the evolution of new genre of flexible electronics that are in stark contrast with rigid smartphones that many of us carry, gingerly, in our back pockets. 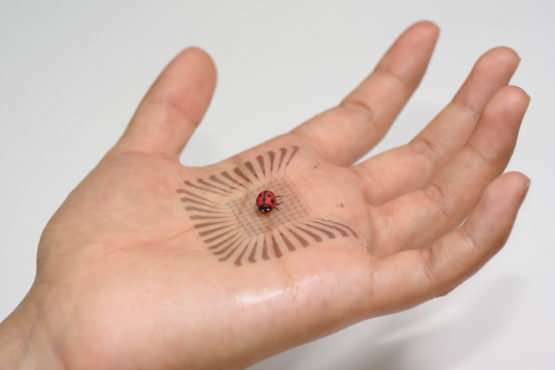 Now, in a Feb. 19 Nature paper, Bao and her team describe two technical firsts that could bring this 20-year goal to fruition: the creation of a stretchable, polymer circuitry with integrated touch-sensors to detect the delicate footprint of an artificial ladybug. 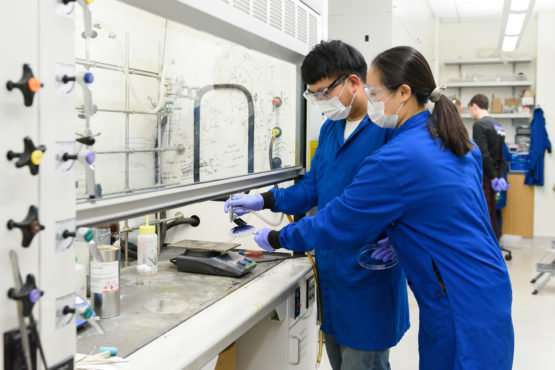 And while this technical achievement is a milestone, the second, and more practical, advance is a method to mass produce this new class of flexible, stretchable electronics – a critical step on the path to commercialization, Bao said. "Research into synthetic skin and flexible electronics has come a long way, but until now no one had demonstrated a process to reliably manufacture stretchable circuits," Bao said. Bao's hope is that manufacturers might one day be able to make sheets of polymer-based electronics embedded with a broad variety of sensors, and eventually connect these flexible, multipurpose circuits with a person's nervous system. Such a product would be analogous to the vastly more complex biochemical sensory network and surface protection "material" that we call human skin, which can not only sense touch, but temperature and other phenomena, as well. But long before artificial skin becomes possible, the processes reported in this Nature paper will enable the creation of foldable, stretchable touchscreens, electronic clothing or skin-like patches for medical applications. Bao said their production process involves several layers of new-age polymers, some that provide the material's elasticity and others with intricately patterned electronic meshes. Still, others serve as insulators to isolate the electronically sensitive material. One step in the production process involves the use of an inkjet printer to, in essence, paint on certain layers. "We've engineered all of these layers and their active elements to work together flawlessly," said post-doctoral scholar Sihong Wang, co-lead author of the paper. The team has successfully fashioned its material in squares about two inches on a side containing more than 6,000 individual signal-processing devices that act like synthetic nerve endings. All this is encapsulated in a waterproof protective layer. The prototype can be stretched to double its original dimensions – and back again – all the while maintaining its ability to conduct electricity without cracks, delamination or wrinkles. To test durability, the team stretched a sample more than one thousand times without significant damage or loss of sensitivity. The real test came when the researchers adhered their sample to a human hand. "It works great, even on irregularly shaped surfaces," said postdoctoral scholar Jie Xu, and the paper's other co-lead author. Perhaps most promising of all, the fabrication process described in this paper could become a platform for evaluating other stretchable electronic materials developed by other researchers that could one day begin to replace today's rigid electronics. Bao said much work lies ahead before these new materials and processes are as ubiquitous and capable as rigid silicon circuitry. First up, she said, her team must improve the electronic speed and performance of their prototype, but this is a promising step. "I believe we're on the verge of a whole new world of electronics," Bao said. Additive manufacturing—a new twist for stretchable electronics?